Norcia, Italy, is a charming town in the high country of Umbria, Italy that is probably most famous in modern times for its pork products. 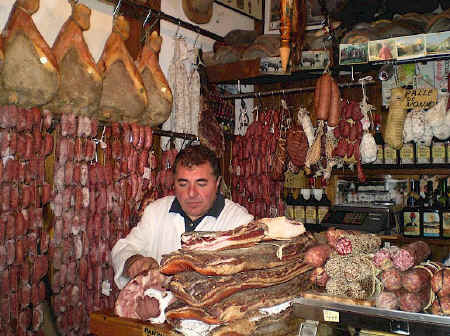 Norcia was always well-known for hunting, especially for wild boar, and its production of sausages, capocollo, salumi and hams made from wild boar and domestic swine has given a word to the Italian language - norcineria - a pork butcher's shop. Other important ingredients of local cuisine are the black truffle, available November to March, and the lentils of Castelluccio di Norcia. Pork sausages, black truffles, cheese and the lentils are the basic ingredients of Norcia's authentic and savoury local cuisine. Be sure to try a plate of sausages and lentils while you're there. Norcia is well worth a visit for additional reasons. Its mountain air and broad streets make for a pleasurable excursion. Norcia is surrounded by the Sybilline mountains but the ancient centre of Norcia is almost flat, which is relatively unusual among the towns of Umbria, and is completely enclosed by a full circuit of walls that has survived intact from the 14 C. This makes Norcia, which is quite small, an easy and relaxing town for a stroll around the main sights. 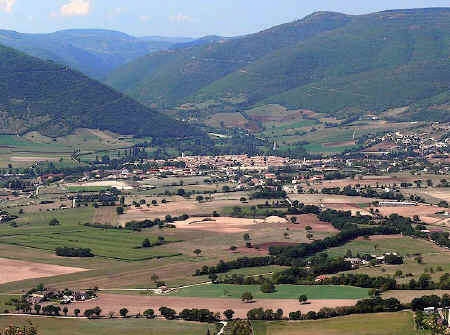 Although neolithic artifacts have been excavated in the vicinity of Norcia, the town's established history begins with settlement by the Sabines in the 5 C BC. Norcia allied itself with Rome in 205 BC, during the Second Punic War, when it was known in Latin as Nursia, but the earliest extant Roman ruins date from around the 1st century AD. Norcia was the birthplace of Quintus Sertorius, the Roman general and Republican hero, in 72 BC, and Vespasia Polla, the mother of the Emperor Vespasian. Saint Benedict, the founder of the Benedictine monastic order, and his twin sister, Saint Scholastica, were born in Norcia in 480. In the following century, Norcia was conquered by the Lombards and became part of the Duchy of Spoleto. In the 9 C, it suffered from Saracen attacks, which started a period of deep decline. By the 11 C, Norcia was part of the domain of Saint Henry, Holy Roman Emperor, and in the 12 C Norcia became an independent municipality within the Papal Territories, with an increasing political and economical importance. However, the vicinity of the powerful Spoleto and the 1324 earthquake thwarted the city's ambitions, and in 1354 it returned definitively under the Papal authority. It is now a municipality in the Region of Umbria.